A tear gas canister, fired by the police, hits protesters during the clashes in front of the National Palace, in the center of Haitian capital Port-au-Prince, Feb. 13, 2019, on the sixth day of protests against Haitian President Jovenel Moise. Hundreds of protesters marched to the National Palace in Haiti's capital, Port-au-Prince, Wednesday to send a message to President Jovenel Moise: It's time to leave. "We're standing here in front of the palace today, because this area does not belong to Jovenel Moise. 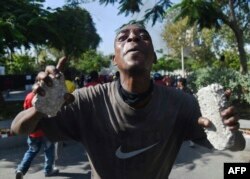 Our taxes paid for it," a male protester told VOA Creole. Asked how he feels about the president's silence so far, he responded, "That's because he doesn't understand yet. By the time he gets it, it will be too late. The people are going to remove him (from power), and we'll seize his belongings, and then he'll understand." "The head of state has shown himself to be reckless, immoral and shameless," opposition Sen. Ricard Pierre told VOA Creole. He was part of the group gathered in front of the palace. "A leader who has any level of self-respect after seeing all of these people protesting in the streets would resign. That just goes to show you that he doesn't care about the people. He only cares about making money." The anger and frustration expressed by the protesters has been echoed by the thousands who have marched nationwide to vent their frustration and anger with the president and his government since Feb. 7. They say they are protesting against inflation, unemployment, corruption and the government's inability to respond to their basic needs. Protesters vowed to continue their demonstrations until the president resigns. VOA Creole reporters saw CIMO (Corps d'Intervention et de Maintien de l'Ordre) security officers in position around the palace to maintain order. 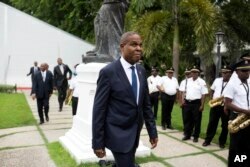 Haiti's prime minister Jean-Henry Ceant walks after his ratification ceremony at the national palace in Port-au-Prince, Haiti, Sept. 17, 2018. The senator planned to meet with an economic forum Wednesday and continue consulting with members of the democratic sector and the Core Group — comprised of the United Nations secretary-general's special representative for Haiti and ambassadors of the United States, Germany, France, Spain, the European Union and Brazil — to try to find a solution to the political crisis. In a communique, the Core Group said it had taken note of the protesters' demands but deplored the loss of life and material damages incurred. Meanwhile, in Washington, Haiti Ambassador Paul Altidor confirmed to VOA Creole that he has been recalled from his post. 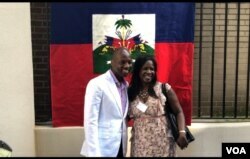 Altidor, who has represented Haiti's government in Washington for seven years, is beloved by the diaspora. Foreign Minister Bocchit Edmond told VOA Creole that Altidor will be replaced by Herve Denis, a former minister of defense. Although the reshuffle is happening in the middle of a critical crisis, the foreign minister stressed that Altidor's recall is part of a routine rotation of all chiefs of mission. "We support the right of all people to demand a democratic and transparent government and to hold their government leaders accountable," a State Department spokesperson for Western Hemisphere Affairs told VOA. "But there is no excuse for violence. Violence leads to instability, less investment and fewer jobs." 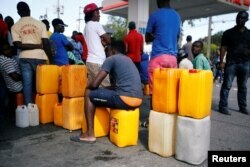 The U.S. has also renewed its warning against travel to the country, which currently stands at Level 3, and advises travelers to reconsider planned trips to Haiti due "due to crime and civil unrest." The most severe status is Level 4, in which the State Department advises, "Do not travel." Matiado Vilme and Renan Toussaint reported from Port-au-Prince. State Department correspondent Nike Ching contributed to this report from Washington.